INDIANAPOLIS — The state's largest police department is moving forward with its plan to equip every police officer with a body camera much sooner than expected. 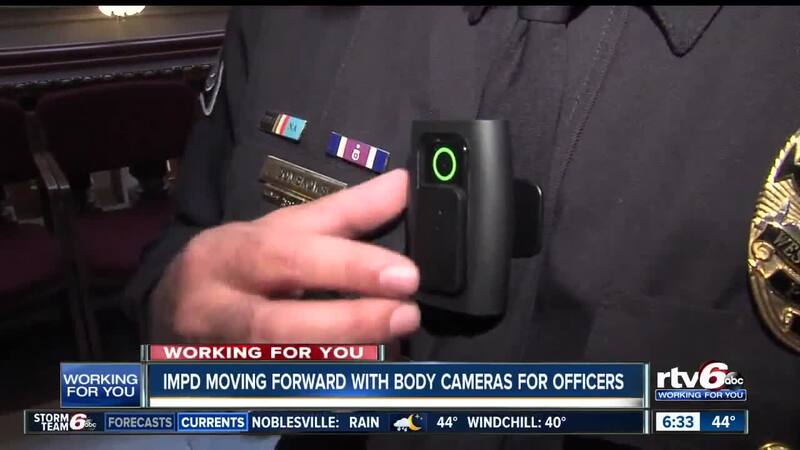 The Indianapolis Metropolitan Police Department has assigned a veteran officer to serve as the project manager of the body camera program, Call 6 Investigates has learned. While it is still early in the process, the department is beginning the process of looking at different options and different technologies, as well as working on policy for when and how the officers would use the camera. The move towards body cameras comes much earlier than expected for IMPD. When Call 6's Paris Lewbel spoke to Chief Bryan Roach and the head of the city's technology Ken Clark back in September, they told us the city wouldn't start working on body cameras until late 2019 or 2020. It's the first major step IMPD has taken towards body cameras since they piloted cameras back in 2014 and 2015. The issue of body cameras came into the spotlight for IMPD when two officers shot and killed Aaron Bailey, an unarmed black man, in 2017. Since the controversial shooting, IMPD Chief Roach has publicly said he wants officers to be equipped with body cameras to increase trust with the public. But in multiple interview with Call 6's Paris Lewbel, he said it wasn't possible because the city's technology infrastructure was too out of date and there wasn't enough funding available for the cameras. Since 2018, the city has made significant improvements to it's technology backbone and IMPD is now utilizing a new Computer Aided Dispatch system, key items that were required before they could move into body cameras. The city is expected to post a formal request for information for body camera vendors to submit details regarding their technologies for the city to review.